After a postseason that saw him criticized for being not just a dirty player, but a selfish one, too, the four-time All-Star is out to prove he's learned from his mistakes and is ready to be the leader his young Padres team needs. Villains don't come to San Diego. Surfers, yes. And sandcastle builders. Tourists. But...villains? On a back field at the Padres' complex, Manny Machado certainly doesn't look like a bad guy. From third base, he uncorks a sidearm fling to Eric Hosmer at first, followed by a snappy comment about his lethal arm that makes Hosmer bust out laughing before coach Glenn Hoffman slaps the next infield ground ball into the spring morning. Surrounded by top prospects like Fernando Tatis Jr. and Hudson Potts, Machado peppers bits of advice into the daily drills, schooling Tatis on how to come around on a ground ball to get a better throwing angle and Potts on how he can handle certain hops more easily with nuanced glove placement. The point is to work smarter by firming up the small things. Machado does not preach and he is not pushy. Maybe you've heard, he does things his way and lets the chips fall where they may. For him, it's led to four All-Star Games, two Gold Gloves, a World Series appearance and, now, the $300 million deal many thought he might have kicked away with his head-scratching October. That he got the $300 million, though, was not nearly as shocking as where it came from. San Diego hasn't made the playoffs since 2006 and has in recent years served more as a retirement home for vintage players past their prime—Greg Maddux, David Wells, Orlando Hudson, Matt Kemp and more—than a magnet for big-time free agents. 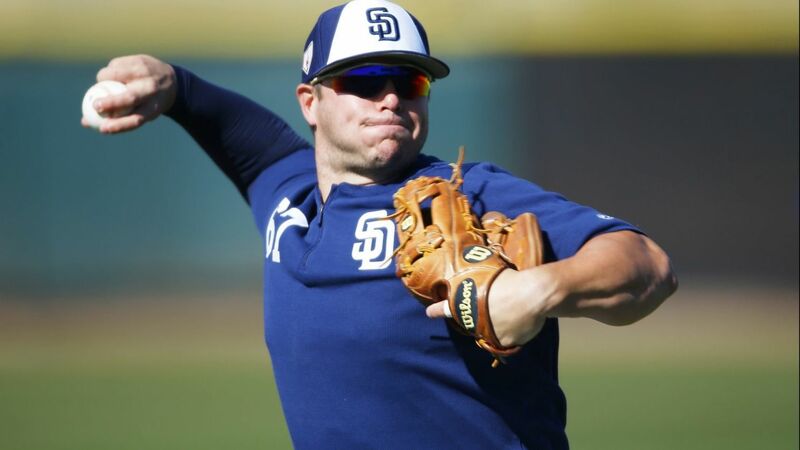 Even with a fleet of hot young prospects who have made the club's farm system the consensus best in the game—Baseball America, MLB Pipeline, FanGraphs and ESPN all rate San Diego as No. 1—conventional thinking had the Padres going nowhere near such an expensive and exotic talent who could, gasp, become a wicked influence on such naive and impressionable young minds. "It's a matter of teaching them, hey, little things turn into big things at the end of the day," Machado explains. "They turn into championships and Gold Gloves, all the accolades you could get. "Little things like that are going to lead to them being better. At the end of the day, I just want to help them be the best players they can." Five months after he told the world that he's no Johnny Hustle, and after the Milwaukee Brewers' Christian Yelich called him a "dirty player" for kicking first baseman Jesus Aguilar's foot as he crossed the bag during last fall's National League Championship Series, Machado, 26, now is a hired gun in a new locale without the wanted posters. "I said what I said, obviously, but I definitely regret saying it," Machado says. "It was misunderstood, in a way. Obviously, I've played my game, I've shown what I can do on the ballfield. Let your game speak for itself and go about your business." In rare public glimpses, Machado reveals a human side that he buries during competition. It is an aspect that largely was ignored last autumn as the decorum vigilantes gathered en masse, neglecting to remember during the loafing lectures that he played in all 162 games in 2018 for the second time in four years and that his 637 games played and 2,808 plate appearances from 2015 to '18 lead the majors. And that he's come back from major surgeries on both knees early in his career. "Look, in baseball, how it's ultimately perceived is how you move forward," Hall of Famer Jim Thome says. "There are things where you maybe feel I shouldn't have said that, and I wasn't there to listen to the [Johnny Hustle] interview, but it's how we move forward in the game. "He's got a chance to go to San Diego and ... make an impact on how [he is] perceived as a leader. Think about it. They brought him over there to be that guy." Thome's words are important because, early in Machado's career in Baltimore, it was Thome doing for Machado what Machado is doing now, dispensing guidance and wisdom to his younger teammates. "We're trying to be a world-class team and he's a huge part of that equation," says second baseman Ian Kinsler, another veteran the Padres signed this winter. "He plays hard. He plays with an edge. That's what you need to be successful. None of that stuff bothers us in here. He's our teammate now. We have his back. That's how he plays the game, and hopefully it rubs off on everyone in here." Celebrating their 50th anniversary season, the Padres know that for far too long they have been viewed as a soft team in a soft market that has served mostly as a punching bag. They'd like to change that perception, and Machado's edge is a key. The sepia-toned story has lasted for decades, and it is oh-so inspiring: Joe DiMaggio is early in the final season of his Hall of Fame career in 1951, mid-30s stiff, everything an effort, when a reporter one day asks why, with all he's done in his brilliant career, he still never, ever takes a play off during a game. Because, DiMaggio responds, "there is always some kid who may be seeing me play for the first or last time. I owe him my best." It is the stuff of lore that grows players from the past into Paul Bunyan-esque legends. But DiMaggio wasn't on television all 162 games each season (in fact, the schedule was only 154 games then, and he played in every game only once). Fans couldn't dial up his exploits 24 hours a day on the internet. There may even have been a time or two that he hit a routine grounder to shortstop on a scorching hot July day and...didn't sprint full-on to first base. And because nobody outside of Yankee Stadium saw it, maybe it just sort of...went away? Machado—and the rest of today's players—do not enjoy that luxury. "There's not many guys on the planet who can relate to batting third or fourth and playing in 150 games a year," says Andrew Miller, the relief ace now pitching for St. Louis. "It's a pretty limited number of people who know what it takes to do that, and he's actually one of them. "Sometimes guys carry themselves in different ways. Robinson Cano has been buried for that his entire career and yet at the end of the day he plays hard all the time and everybody would take him. Not everyone looks like Dustin Pedroia, or whoever the other end of the spectrum is. "Any way you cut it, star players who can play almost every day, they're a rare breed." Miller spent the final two months of 2014 with Machado after a July 31 trade. When Miller arrived in Baltimore, he found that among the many things he needed to adjust to, finding a pair of orange and black cleats the Orioles required then would be one of his more difficult tasks. Machado, then just 21, was the first man to approach Miller and offer an extra pair of his spikes. "As a new guy coming in, you're begging for people to make you comfortable," Miller says. "A relief pitcher and a starting third baseman, honestly, there's not a lot of overlap. But he was really welcoming to me. It was really generous." It is the kind of thoughtfulness his old Orioles teammates routinely experienced. Kevin Gausman, now in Atlanta's rotation, talks appreciatively of how Machado regularly went out of his way to say hello to Gausman's father whenever he was around the club without fanfare. Gausman, in fact, didn't even realize it until this offseason when his father brought it up in the midst of the Machado backlash. But when it's Game On...the manners recede. For a time in Baltimore, Machado battled his good friend, second baseman Jonathan Schoop, in legendary clubhouse chess matches. Chess, pool, pingpong...you name it, everyone knew Machado would do anything to win. And during games, Gausman would hear the two friends good-naturedly chirping at each other behind him, Machado bragging after a good throw that Schoop couldn't have made with his weaker arm, or Schoop after a homer making sure Machado knew just how far it went. That inner drive served Machado well early in his career while he overcame devastating injuries. His knees always had been temperamental, he says, the result of being born with shallow grooves on his kneecaps. He had dislocated his left kneecap in rookie ball during his first month as a professional in 2010. Then, while crossing the first base bag hustling to beat out an infield ground ball at Tropicana Field in September 2013, he crumpled to the ground in agony. Machado fought back from reconstructive surgery on his left knee, only to wreck his right knee while swinging during an at-bat the next August. The same surgery was performed on that right knee as on the left a year earlier. "Those definitely changed my perspective on things a lot," Machado says. "It's something you learn from. I'm sort of grateful I had to go through that process because it made me the person I am today." Meeting Thome as a 19-year-old rookie in August 2012 also shaped him. Thome had been acquired as a veteran bat that June and immediately impressed upon Machado the importance of a consistent routine in game preparation. "Then Nelson Cruz comes a couple of years later  and kind of says the same thing," Machado says. "We called Nelson our father. We kind of [got] under his wing, start working out, cage work, massage after, recovery to get ready for the game tomorrow. Those little things like that you learn, it takes your game to another level." It's why today Thome and Cruz remain sacred touchstones to him. "Because if I would have prepared better my first year as a rookie and gotten a lot stronger throughout the year, maybe [the injuries] wouldn't have happened," he says. "Probably, because of how my knees were, they would have, but I could have at least prevented a little more. "I was young at the time. I wasn't in the weight room. I wasn't doing all the little things to take care of my body. That's why now I'm really into it. It's why I try to help out the younger guys. Hey, it don't matter that you're 20 or 19, or 36 or 37. Baseball is a grind every day, and that's why you need to take care of your body." That the injuries played so big a role in Machado's early career makes you wonder if the memories of them play a role when he periodically moves into, ahem, conservation mode? "No," Machado answers. "It's just how I've always played since I was in the minor leagues. ... You don't necessarily pick and choose where you do it, but you do get wise and you get smarter as the years go on. Last year I played through October, and it's a grind. It's not easy." After the Aguilar incident, for which Machado was fined $10,000 by MLB, retired pitcher LaTroy Hawkins, who ranks in the top 10 all-time in games pitched, dialed up video of Machado's first knee injury while trying to make sense of it because "I love watching Manny play, so when that incident happened, I immediately thought about his leg injury." Hawkins noticed that Machado stepped on the outside of the first base bag when the knee gave out and wondered whether he maybe makes it a point now to not step on the outside of the bag, but instead to step closer to the middle of the bag. Machado, who says he's never seen the grotesque replay and goes out of his way to avoid it, pauses momentarily when he hears this. "That's interesting," he says. "I have no idea ... I guess it maybe could be something mental. ... They say to run on the dirt, but I kind of run on the [infield] grass because of my swing. I have that long follow-through, so ... I have to deviate and try to come back to the base path. "It's something I'm going to have to look into ... because people do say when you get injured, you [subconsciously change things] in the back of your mind. ... It could be." Over a nearly five-hour lunch in Miami in early February, drinking cafe con leche and munching on fried yucca with mojo sauce and pork chunks, Padres general manager A.J. Preller and Manny and his wife, Yainee, covered these subjects and more. Machado jokes that the lunch probably went on a little too long. He remembers Preller arriving armed with a notebook full of prepared questions and freelancing others. "We talked about some of the things from the past and, obviously, last October, and the biggest thing that stuck out was Manny understanding," Preller says. "We talked about those things openly. His perception of different events and things that happened in October, and the biggest thing to me was he's learned from it. "We didn't get into judgment of right or wrong or anything like that because, as an organization, everybody is going to make mistakes. That's what I tried to share with him. Everybody in an organization is going to make mistakes. We want the environment where you feel comfortable understanding that, but then, how do you learn from those mistakes? From your different experiences?" These are questions Machado has faced throughout his life, since he braved the Metrorail alone at 12 or 13 for rides of up to an hour through downtrodden neighborhoods to various Miami baseball fields. They intensified once he reached the majors, especially during an ugly bench-clearing incident against Oakland (2014), a brawl with Kansas City (2016) and a dangerous back-and-forth of aggressive plays against Boston (2017). Throughout, his hometown support system, particularly brother-in-law Yonder Alonso—Yainee is Yonder's sister—and veteran outfielder Jon Jay, an older brother of sorts at 34, advised and mentored him. The conversations continued this winter after Machado's sudden emergence as Public Enemy No. 1, though in a different vein. "I can't put myself in his shoes as far as being drafted at 17 and pretty much knowing from the time you're 14 years old that you're going to be a big leaguer," says Jay, who prefers to keep the specifics of his talks with Machado private. "Not many people grow up like that. Those are the LeBron Jameses, the Kobe Bryants, these special talents that you just know. "You see him in the cage and know this guy's going to be in the big leagues. The pressure and expectations that come with that, it's not easy. We all continue to mature." Alonso's preferred tack was simply to give Machado space and focus on family, not baseball, this winter. Knowing the kind of person his brother-in-law is, Alonso says, made it "pointless" for him even to talk about the raging events of October. "Our family is very tight," says Alonso, who, like Jay, was acquired by Chicago this winter as the White Sox wooed Machado. "Our family knows what happens inside our house, under our roof. We don't pay attention to all that white noise. We don't pay attention to all the criticism. We live a positive life. We live a life that's very wonderful and happy and we don't dwell on all that negativity." As Preller says, everybody makes mistakes. But time and again, Machado has shown he learns from his miscues. Back in 2014, coming off his left knee surgery and just before he injured his right knee, Machado was hitting just .216 as the Orioles arrived in Houston. When he didn't run hard on an infield ground ball, Baltimore first base coach Wayne Kirby had seen enough and delivered a stern lecture. "Manny," Kirby told him. "My son looks up to you every day. Every kid in this ballpark looks up to you every day. They expect you to hustle because you're on camera all the time. So give me 100 percent of what you've got. Even if it's 100 percent of 75 percent, or 65 percent, give me that and you can hold your head up." Now living in Las Vegas, Kirby offers a vigorous endorsement of everything Manny—as a man, as a teammate and as a competitor. Still, to Kirby, last October wasn't a revelation. Machado always has had his, shall we say, casual Friday moments. But the rest of the package usually eclipses them. "That young team over there better watch out, because he's going to be ready to compete," Kirby says. "Tatis Jr., he's going to have to compete every day. Because Manny will be like, 'I'm still the Man, arm-wise and everything.' He'll do anything for you, anything you need to be done: Sign autographs, sign bats, he don't mess around. He'll do it. "And he was starting to become a leader. It takes time to become a leader." That young team needs it. "We have a lot of young guys, and guys need to hear a different voice," says Eric Hosmer, San Diego's big free-agent addition last offseason. "They hear it from me all the time, and from a lot of coaches. But now a lot of people look up to Manny in this game, and when they hear it from his voice, it's a strong message. "For Tatis, it couldn't be a better setup. You see him and Manny at shortstop and third base, and it looks like Manny from 10 years ago and Manny now. I think it's going to speed up Tatis' development because Tatis checks all the boxes." From that lunch in Miami until now, what the Padres have emphasized to Machado is simply, "Be yourself. Don't try to be somebody you're not." "Be comfortable," Preller says. "And we talked about how we can get the other players to complement him and understand this isn't going to be a one-man show. You need a lot of good players to win. We have a lot of good pieces here in this building." Sometimes, even villains can become heroes in the end, you know.